괘불이란 절에서 큰 법회나 의식이 열릴 때 법당 앞 뜰에 걸어놓고 예배를 드리기 위해 만든 대형 불교그림를 말하는데, 이 불화는 거대한 화면에 불을 단독으로 그린 형식으로 비단바탕에 채색되었다. 이 괘불의 불(佛) 좌우로 대칭되게 장식을 넣어 자칫 단조로워지기 쉬운 화면을 조화롭게 나타내었다. 녹색의 머리광배에 붉은색의 옷을 입고 있으며, 둥근 얼굴에는 부드러운 표정을 짓고 있다. 어깨선 또한 둥글게 처리되어 전체적으로 원만하고 부드러운 이미지를 나타낸다. 화면 윗부분의 양쪽에는 새와 덮개 장식이 있고 중앙부의 양쪽으로는 모란이 배치되어 있어 불세계의 평화스러움을 상징적으로 표현하였다. 황토바탕에 붉은색과 녹색이 주로 사용되었으며 필치가 매우 정밀하면서도 세련되어 활기찬 인상을 준다. 영조 26년(1750)에 제작된 이 괘불은 연꽃이 활짝 피어난 연못으로부터 천상세계로의 상승을 나타낸 상징적인 화면구성을 하고 있으며 원만한 형태, 세련된 필선, 적절한 색의 조화 등이 매우 돋보이는 18세기 불화 중 걸작으로 꼽히는 작품이다. This type of large-sized painting used to be hung in the front courtyard of a temple hall at an open-air sermon session or ritual. This piece, made on silk satin, contains symmetrical decorative patterns on both sides of the Buddha at the center. The Buddha dons a red robe and wears a benevolent facial expression, with a green mandorla laid behind his head. The round shoulders create a soft, smooth atmosphere. 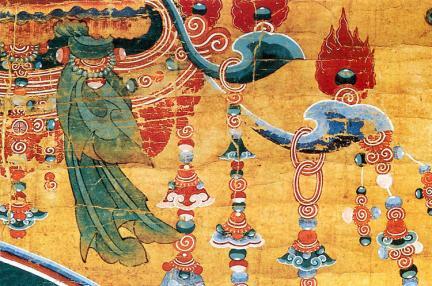 The top of the painting is adorned with birds and canopy. 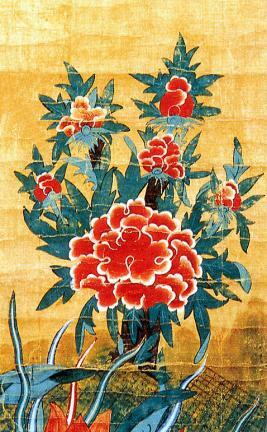 Peonies laid on both sides of the center symbolize peace of the Buddhist world. Red and green colors are used a lot on the ocher-colored silk satin, with the brush strokes exquisite and refined. 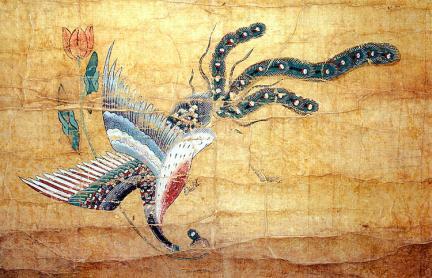 Made in 1750 (the 26th year of King Yeongjo’s reign), the painting shows the rise from a pond where lotus flowers are in full bloom to the heavenly world. It is said to be a masterpiece among the Buddhist paintings of the 18th Century, featuring the refined shapes of things, sophisticated brush strokes, and nice combination of colors.